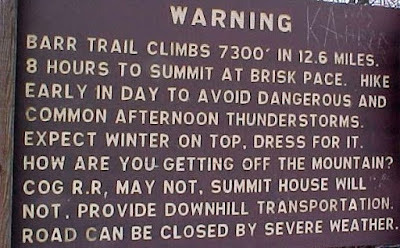 If you have been reading our adventures than you know that we tried in an earlier adventure to summit Pikes Peak along the Barr trail and failed when it got to late in the day to make it to the top. If you missed it click here this story will make more sense. So this time were are going to do things a little differently. Instead of trying to summit on the first day we are going to stay overnight at Barr camp before proceeding on early the next morning to the summit. This will do a couple of things. We will be able to acclimatize to the thin air overnight (very important) and it will keep us off the mountain face in the afternoon when it gets hot and sunny. Cool is better in a strenuous hike. As well as avoiding the frequent lightning strikes on the peak in the late afternoon. No matter how hard I tried I still couldn’t fix the fact that it was 13 miles 1 way to the top though. We are also going to take along some hiking companions Dean and Danny Kroon will accompany us on the summit attempt. We made good time along the first half of the trail carrying our heavy packs full of overnight camping supplies. I even smuggled a bottle of Bailey's Irish cream along In my backpack. For much of the first portion of the hike you cannot even see the summit. There are many other smaller peaks in the way to cross before you get there. At last about mid morning we got our 1st view of the summit along a hillside where we stopped for a break. Back down into a valley and part way up the next mountain flank lies Barr camp our destination for the day. We arrive just before noon at Barr camp and unload our supplies. We now have the rest of the day to kill before attempting the summit early the next morning. We wandered around Barr camp reading books,taking pictures and sitting by the creek that supplies fresh water to the camp . (you have to filter it to drink it). The camp has a few books and games to occupy folks that are staying overnight. While we were staying the afternoon. The rescue folks that stay at Barr got a call to evacuate a hiker with a broken ankle off the side of the mountain near tree line. They found the hiker and carried them to the COG railroad stop near Barr camp for evacuation. We enjoyed a cheap meal ($3 a piece) provided by the cook at Barr camp for Dinner along with about a dozen other campers. After dinner we enjoyed the smuggled Baileys with Dean and Denny before going to bed in the shelters provided at Barr Camp. The next morning we awoke at a little after 5:00am. We were having a breakfast of hearty pancakes, provide again by the cook at Barr camp before we take off for the summit. We wanted to hit that trail by 7:00. We would leave out heavy packs here and pick them up on the way back through later this afternoon. Just west of Barr camp is a trail sign and a sign in sheep for those venturing up on the mountain. 6 miles to the summit, 4 to the Bottomless Pit. We better get moving! 7:00am in the morning at 11,00 feet is cool approx 45 degrees, but the hiking keeps you warm. We arrive at the tree line meadow, as far as we made it last time around 9:30. We are making good time. Three miles to the summit. We should be there around noon. We take about a half an hour to rest have a snack and just enjoy the beautiful meadow. Everyone it seems has a place in their memory that’s a favorite to revisit, a beautiful safe place you like to think about when your stressed or before you go to sleep. This little meadow is one of mine. She looks in a lot better shape this time around (me too). The overnight stay and cooler temperatures made all the difference in the world. Dean and Danny applying sun screen at the tree line shelter before the final push to the summit. Just a short way past tree line you can start to see the 7 Lakes area south of Pikes Peak that supply some of the drinking water to Colorado Springs. 7 Lakes is a restricted area and you are not allowed to hike in it. The rock formations are amazing as you make your way to the top. You cannot tell from the photo, but many of the rocks strewn about are as large as houses. Along the trail here is a plaque where an 88 year old woman Inestine B. Roberts died on her 14th summit hike early in the 1957 Amazing! A rest break with pictures and were off again. Dean says "You almost think you can fly"
The Summit facing south towards the 7 lakes area. We had lunch at the restaurant inside filled up on water and started back down to Barr Camp just before 1:00PM on Sunday. We had to go to work tomorrow morning. To make a long story short we made it to our cars at the trail head just after 6:00PM in the afternoon on Sunday. We had hiked 19 miles on Sunday the last 7 carrying heavy packs, but we beat the Barr Trail! Monday is really going to hurt though!